HIV infection leads to progressive CD4 T cell depletion, resulting in the development of AIDS. The mechanisms that trigger T cell death after HIV infection are still not fully understood, but a lot of data indicate that apoptosis of uninfected CD4 lymphocytes plays a major role. HIV directly modulates cell death using various strategies in which several viral proteins, in particular the envelope glycoproteins (Env), play an essential role. 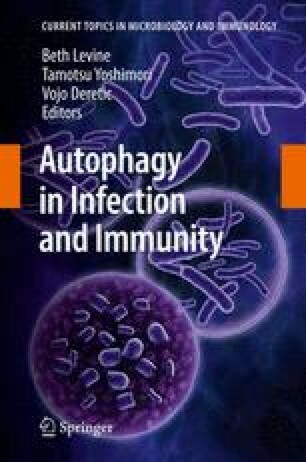 Importantly, Env, expressed on infected cells, triggers autophagy in uninfected CD4 T cells, leading to their apoptosis. Furthermore, HIV, like other viruses, has evolved strategies to inhibit this autophagic process in HIV-infected cells. This discovery further increases the level of complexity of the cellular processes involved in HIV-induced pathology. Interestingly, HIV protease inhibitors, currently used in highly active antiretroviral therapy (HAART), are able to induce autophagy in cancer cells, leading to a recent repositioning of these drugs as anticancer agents. This review presents an overview of the relationship between HIV, HAART, and autophagy. Institutional funds from the Centre National de la Recherche Scientifique (CNRS) and the University of Montpellier, as well as grants from SIDACTION and the Agence Nationale de Recherches sur Le SIDA (ANRS) supported this work. We thank I. Robbins for helpful scientific discussions and careful critical reading of the manuscript.